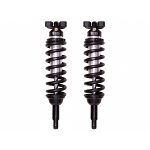 Boss Rear shocks by HaloLifts for your 04-19. This is for a pair of rear shocks (2). More Travel, better performance, less body roll. You will love them. 4wd or 2wd, fits both. Will accommodate rear blocks from stock to 3". Our Boss rear shocks come stock with Black boots, if you would like a color boot please pick it from the drop down tab. Your Boss rear shocks will arrive with the color boots you chose. WeatherWrap option. For anyone living in harsh winter conditions, salt on the road, calcium chloride, we wrap your rear Boss shocks in a Carbon is a black carbon fiber vinyl wrap. If you had limited funds and can only upgrade one item on your truck do these shocks first they are amazing on the road and very good offroad. They totally change the ride of the F150 to handle better in every way. 100 percent of the random shaking, jiggling, bouncing is gone with these shocks and they are butter smooth on road. Best bang for the buck upgrade and should be the first upgrade on the F150. These should have been an option from the Ford factory.